Legendary singer-songwriter Mel Tormé performs the first of a 13-day engagement at the Top of the World, located atop Disney World's Contemporary Resort. 1948 live-action So Dear to My Heart. refurbish the original animation studio of Walt Disney (located in Kansas City). Disney Foundation is contingent on whether the Thank You organization can match the amount. Little Mermaid and Beauty and the Beast. City, home of Disney's The Lion King. same name by Thomas Disch, features the voices of Jon Lovitz and Phil Hartman (known for their performances on Saturday Night Live), Deanna Oliver, Timothy E. Day and veteran voice actor Thurl Ravenscroft. 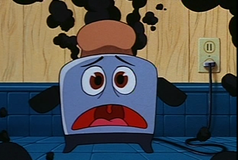 Co-written by Joe Ranft (who in a few years will go on to work for Pixar) The Brave Little Toaster will receive an Emmy nomination for Best Animated Program. Ranft also supplies the voice of Elmo St. Peters, one of the major antagonists of the film. of ten miles around here." commending him for his bravery. the single "Potential Breakup Song," the album will sell 39,000 copies in the U.S. in its first week. label) is currently #1 on Billboard's "Hot Digital Songs" chart and #3 on Billboard's "Hot 100" chart. Disney's Beauty and the Beast is widely released in theaters in Brazil. of young guys working around the corner of 31st and Troost, or 31st and Forest." Your Sunday Clothes" and "It Only Takes a Moment" can be heard in the Disney/Pixar 2008 release Wall-E.
android double (both portrayed by Dennis Dugan) travel back to the time of King Arthur. When released in U.S.
theaters later in the month, the film be will titled Unidentified Flying Oddball. (a lively piano bar with dueling pianos and audience sing-alongs) is named in tribute to Morton. the hit television series The Office, she is the voice of Sadness in Pixar's 2015 release Inside Out. 60th anniversary of Disneyland. The Legacy Collection: Toy Story is the 10th (of what will be 14) in the series.